Situated on the Fall Line, Georgetown was the farthest point upstream that oceangoing boats could navigate the Potomac River. In 1632, English fur trader Henry Fleet documented a Native American village of the Nacotchtank people called Tohoga on the site of present-day Georgetown and established trade there. The area was then part of the Province of Maryland, an English colony. George Gordon constructed a tobacco inspection house along the Potomac in approximately 1745. The site was already a tobacco trading post when the inspection house was built. Warehouses, wharves, and other buildings were then constructed around the inspection house, and it quickly became a small community. It did not take long before Georgetown grew into a thriving port, facilitating trade and shipments of goods from colonial Maryland. In 1751, the legislature of the Province of Maryland authorized the purchase of 60 acres (240,000 m2) of land from Gordon and George Beall at the price of £280. A survey of the town was completed in February 1752. Since Georgetown was founded during the reign of George II of Great Britain, some speculate that the town was named after him. Another theory is that the town was named after its founders, George Gordon and George Beall. The Maryland Legislature formally issued a charter and incorporated the town in 1789. (Although Georgetown was never officially made a city, it was later referred to as the "City of Georgetown" in several 19th-century acts of Congress.) Robert Peter, an early area merchant in the tobacco trade, became Georgetown's first mayor in 1790. Col. John Beatty established the first church in Georgetown, a Lutheran church on High Street. Stephen Bloomer Balch established a Presbyterian Church in 1784. In 1795, the Trinity Catholic Church was built, along with a parish school-house. Construction of St. John's Episcopal Church began in 1797, but paused for financial reasons until 1803, and the church was finally consecrated in 1809. Banks in Georgetown included the Farmers and Mechanics Bank, which was established in 1814. Other banks included the Bank of Washington, Patriotic Bank, Bank of the Metropolis, and the Union and Central Banks of Georgetown. Newspapers in Georgetown included the Republican Weekly Ledger, which was the first paper, started in 1790. The Sentinel was first published in 1796 by Green, English & Co. Charles C. Fulton began publishing the Potomac Advocate, which was started by Thomas Turner. Other newspapers in Georgetown included the Georgetown Courier and the Federal Republican. William B. Magruder, the first postmaster, was appointed on February 16, 1790, and in 1795, a custom house was established on Water Street. General James M. Lingan served as the first collector of the port. In the 1790s, City Tavern, the Union Tavern, and the Columbian Inn opened and were popular throughout the 19th century. Of these taverns, only the City Tavern remains today, as a private social club (the City Tavern Club) located near the corner of Wisconsin Avenue and M Street. George Washington frequented Georgetown, including Suter's Tavern where he worked out many deals to acquire land for the new Federal City. A key figure in the land deals was a local merchant named Benjamin Stoddert, who arrived in Georgetown in 1783. He had previously served as Secretary to the Board of War under the Articles of Confederation. Stoddert partnered with General Uriah Forrest to become an original proprietor of the Potomac Company. Stoddert and other Potomac landowners agreed to a land transfer deal to the federal government at a dinner at Forrest's home in Georgetown on March 28, 1791. Stoddert bought land within the boundaries of the federal district, some of it at the request of Washington for the government, and some on speculation. He also purchased stock in the federal government under Hamilton's assumption-of-debt plan. The speculative purchases were not, however, profitable and caused Stoddert much difficulty before his appointment as Secretary of the Navy to John Adams. Stoddert was rescued from his debts with the help of William Marbury, later of Marbury v. Madison fame, and also a Georgetown resident. He ultimately owned Halcyon House at the corner of 34th and Prospect Streets. The Forrest-Marbury House on M Street is currently the embassy of Ukraine. By the 1820s, the Potomac River had become silted up and was not navigable up to Georgetown. Construction of the Chesapeake & Ohio Canal began in July 1828, to link Georgetown to Harper's Ferry, Virginia (West Virginia after 1863). But the canal was soon in a race with the Baltimore & Ohio Railroad and got to Cumberland eight years after the railroad, a faster mode of transport, and at the cost of $77,041,586. It was never profitable. From its beginning to December 1876, the canal earned $35,659,055 in revenue, while expending $35,746,301. The municipal governments of Georgetown and the City of Washington were formally revoked by Congress effective June 1, 1871, at which point its governmental powers were vested within the District of Columbia. The streets in Georgetown were renamed in 1895 to conform to the street names in use in Washington. By the late 19th century, flour milling and other industries in Georgetown were declining, in part due to the fact that the canals and other waterways continually silted up. Nathaniel Michler and S.T. Abert led efforts to dredge the channels and remove rocks around the Georgetown harbor, though these were temporary solutions and Congress showed little interest in the issue. An 1890 flood and expansion of the railroads brought destitution to the C&O Canal, and Georgetown's waterfront became more industrialized, with narrow alleys, warehouses, and apartment dwellings which lacked plumbing or electricity. Shipping trade vanished between the Civil War and World War I. As a result, many older homes were preserved relatively unchanged. 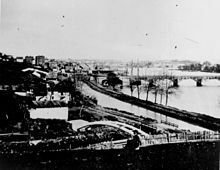 In 1915, the Buffalo Bridge (on Q Street) opened and connected this part of Georgetown with the rest of the city east of Rock Creek Park. Soon thereafter, new construction of large apartment buildings began on the edge of Georgetown. In the early 1920s, John Ihlder led efforts to take advantage of new zoning laws to get restrictions enacted on construction in Georgetown. A 1933 study by Horace Peaslee and Allied Architects laid out ideas for how Georgetown could be preserved. The C & O Canal, then owned by the Baltimore & Ohio Railroad, formally ceased operations in March 1924. After severe flooding in 1936, B & O Railroad sold the canal to the National Park Service in October 1938. The waterfront area retained its industrial character in the first half of the 20th century. Georgetown was home to a lumber yard, a cement works, the Washington Flour mill, and a meat rendering plant, with incinerator smokestacks and a power generating plant for the old Capital Traction streetcar system, located at the foot of Wisconsin Avenue, which closed in 1935, and was demolished in October 1968. In 1949, the city constructed the Whitehurst Freeway, an elevated highway above K Street, to allow motorists entering the District over the Key Bridge to bypass Georgetown entirely on their way downtown. In 1950, Public Law 808 was passed, establishing the historic district of "Old Georgetown". The law required that the United States Commission of Fine Arts be consulted on any alteration, demolition, or building construction within the historic district. In 1967, the Georgetown Historic District was listed on the U.S. National Register of Historic Places. Georgetown is home to many politicians and lobbyists. Georgetown's landmark waterfront district was further revitalized in 2003 and includes hotels such as a Ritz-Carlton and a Four Seasons. Georgetown's highly traveled commercial district is home to a variety of specialty retailers and fashionable boutiques. Georgetown is bounded by the Potomac River on the south, Rock Creek to the east, Burleith, Glover Park, and Observatory Circle to the north, with Georgetown University on the west end of the neighborhood. Much of Georgetown is surrounded by parkland and green space that serve as buffers from development in adjacent neighborhoods, and provide recreation. Rock Creek Park, the Oak Hill Cemetery, Montrose Park and Dumbarton Oaks are located along the north and east edge of Georgetown, east of Wisconsin Avenue. The neighborhood is situated on bluffs overlooking the Potomac River. As a result, there are some rather steep grades on streets running north-south. The famous "Exorcist steps" connecting M Street to Prospect Street were necessitated by the hilly terrain of the neighborhood. Georgetown in the 1850s had a large African-American population, including both slaves and free blacks. Slave labor was widely used in construction of new buildings in Washington, in addition to provide labor on tobacco plantations in Maryland and Virginia. Slave trading in Georgetown began in 1760, when John Beattie established his business on O Street and conducted business at other locations around Wisconsin Avenue. Other slave markets ("pens") were located in Georgetown, including one at McCandless' Tavern near M Street and Wisconsin Avenue. Slave trading continued until 1850, when it was banned in the District as one element of the Compromise of 1850. Congress abolished ownership of slaves in the entire District on April 16, 1862, annually observed today as Emancipation Day. Many African Americans moved to Georgetown following the Civil War, establishing a thriving community. In the late 18th century and 19th century, African Americans comprised a substantial portion of Georgetown's population. The 1800 census reported the population in Georgetown at 5,120, which included 1,449 slaves and 227 free blacks. A testament to the African-American history that remains today is the Mount Zion United Methodist Church, which is the oldest African-American congregation in Washington. Prior to establishing the church, free blacks and slaves went to the Dumbarton Methodist Church where they were restricted to a hot, overcrowded balcony. The church was originally located in a small brick meetinghouse on 27th Street, but it was destroyed by fire in the 1880s. The church was rebuilt on the present site. Mount Zion Cemetery offered free burials for Washington's earlier African-American population. "From a pre-Civil War population of 6,798 whites, 1,358 free Negroes, and 577 slaves, Georgetown's population had grown to 17,300 but half these residents were poverty-stricken Negroes." Throughout the 18th, 19th, and 20th centuries the concentration of wealth in Georgetown sparked the growth of many university-preparatory schools in and around the neighborhood. One of the first schools was the Columbian Academy on N Street, which was established in 1781 with Reverend Stephen Balch serving as the headmaster. District of Columbia Public Schools operates area public schools, including Hyde-Addison Elementary School on O Street. Hyde-Addison formed as a merger of two adjacent schools, Addison Elementary and Hyde Elementary, and has two entrances. The Addison section was renovated in 2008 while the Hyde section was renovated in Summer 2014. An addition connecting the two buildings is scheduled for completion in Summer 2019. Hardy Middle School and Wilson High School both serve Georgetown as zoned secondary schools. Duke Ellington School of the Arts, a public magnet school, is in the community. The main campus of Georgetown University is located on the western edge of the Georgetown neighborhood. 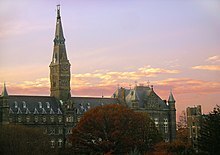 Father John Carroll founded Georgetown University as a Jesuit private university in 1789, though its roots extend back to 1634. Although the school struggled financially in its early years, Georgetown expanded into a branched university after the American Civil War under the leadership of university president Patrick Francis Healy. As of 2007[update], the university has 6,853 undergraduate students and 4,490 graduate students on the main campus. The main campus is just over 102 acres (41 ha) in area and includes 58 buildings, student residences capable of accommodating 80 percent of undergraduates, various athletic facilities, and the medical school. Most buildings employ collegiate Gothic architecture and Georgian brick architecture. Campus green areas include fountains, a cemetery, large clusters of flowers, groves of trees, and open quadrangles. The main campus has traditionally centered on Dahlgren Quadrangle, although Red Square has replaced it as the focus of student life. Healy Hall, built in Flemish Romanesque style from 1877 to 1879, is the architectural gem of Georgetown's campus, and is a National Historic Landmark. The District of Columbia Public Library operates the Georgetown Neighborhood Library, which originally opened at 3260 R St. NW in October 1935 on the site of the former Georgetown Reservoir. An earlier public library in Georgetown was endowed by financier George Peabody in 1867 and opened in a room of the Curtis School on O Street opposite St. John's Church in 1875. In the early 1930s a library committee was formed to encourage the establishment of a new public library branch in Georgetown. The building was severely damaged by a fire on April 30, 2007 and underwent a $17.9 million renovation and expansion. The building was re-opened on October 18, 2010 with a LEED-Silver Certification from the U.S. Green Building Council. A newly constructed, climate-controlled third floor now houses the collections of the original Peabody Library and is a center for research on Georgetown history. Georgetown's transportation importance was defined by its location just below the fall line of the Potomac River. The Aqueduct Bridge (and later, the Francis Scott Key Bridge) connected Georgetown with Virginia. Before the Aqueduct Bridge was built, a ferry service owned by John Mason connected Georgetown to Virginia. In 1788, a bridge was constructed over Rock Creek to connect Bridge Street (M Street) with the Federal City. 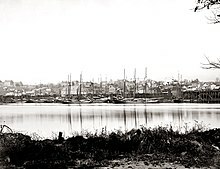 Georgetown was located at the juncture of the Alexandria Canal and the Chesapeake and Ohio Canal. The C&O Canal, begun in Georgetown in 1829, reached Cumberland, Maryland in 1851, and operated until 1924. Wisconsin Avenue is on the alignment of the tobacco hogshead rolling road from rural Maryland, and the Federal Customs House was located on 31st Street (now utilized as the post office). The city's oldest bridge, the sandstone bridge which carries Wisconsin Avenue over the C&O Canal, and which dates to 1831, was reopened to traffic on May 16, 2007, after a $3.5 million restoration. It is the only remaining bridge of five constructed in Georgetown by the Chesapeake & Ohio Canal Company. Several streetcar lines and interurban railways interchanged passengers in Georgetown. The station was located in front of the stone wall on Canal Road (currently occupied by a gas station) adjacent to the Exorcist steps, and the Georgetown Car Barn, formerly operated by the Capital Traction Company, at the end of the Key Bridge. Four suburban Virginia lines, connecting through Rosslyn, Virginia, provided links from the D.C. streetcar network to Mount Vernon, Falls Church, Great Falls, Fairfax, Vienna, Leesburg, and Purcellville. Streetcar operations in Washington, D.C. ended January 28, 1962. The Baltimore and Ohio Railroad built an 11-mile branch line from Silver Spring, Maryland, to Water Street in Georgetown in an abortive attempt to construct a southern connection to Alexandria, Virginia. The line served as an industrial line, shipping coal to a General Services Administration power plant on K Street (now razed) until 1985. The abandoned right-of-way has since been converted into the Capital Crescent Trail – a rails-to-trails route – and the power plant replaced by a condo. There is no Metro station in Georgetown. Some residents opposed building one but no serious plans for a station existed in the first place, primarily due to the engineering issues presented by the extremely steep grade from the Potomac River (under which the subway tunnel would run) to the center of Georgetown, very close to the river. The planners expected the Metro to serve rush-hour commuters, and the neighborhood has few apartments, office buildings, or automobile parking areas. Since the Metro's opening, there have been occasional discussions about adding another subway line and tunnel under the Potomac to service the area. Three stations are located roughly one mile (1.6 km) from the center of Georgetown: Rosslyn (across the Key Bridge in Arlington), Foggy Bottom-GWU, and Dupont Circle. Georgetown is served by the 30-series, D-Series, and G2 Metrobuses, as well as the DC Circulator. The entire Georgetown neighborhood is a designated National Historic Landmark District. It received this designation in 1967 for its large concentration of well-preserved colonial and Federal period architecture. Georgetown Lutheran Church was the first church in Georgetown, dates back to 1769. The current church structure, the fourth on the site, was built in 1914. Georgetown Presbyterian Church was established in 1780 by Reverend Stephen Bloomer Balch. Formerly located on Bridge Street (M Street), the current church building was constructed in 1881 on P Street. 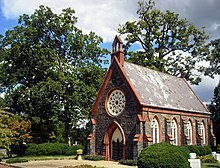 The Oak Hill Cemetery, a gift of William Wilson Corcoran whose Gothic Revival chapel and gates were designed by James Renwick, is the resting place of Abraham Lincoln's son Willie and other figures. 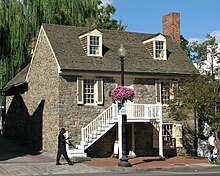 The Old Stone House, built in 1765, located on M Street is the oldest original structure in Washington, D.C. The Volta Laboratory and Bureau, created by Alexander Graham Bell as his first formal research laboratory, the profits from which were used to create a research and educational institution devoted to serving the deaf, which operates today as the Alexander Graham Bell Association for the Deaf and Hard of Hearing, also known as the 'AG Bell'. Georgetown was home to Francis Scott Key who arrived as a young lawyer in 1808 and resided on M Street. Dr. William Beanes, a relative of Key, captured the rear guard of the British Army while it was burning Washington during the War of 1812. When the mass of the army retreated, they retrieved their imprisoned guard and took Dr. Beanes as a captive to their fleet near Baltimore. Key went to the fleet to request the release of Beanes, was held until the bombardment of Fort McHenry was completed, and gained the inspiration for "The Star-Spangled Banner". Alexander Graham Bell's earliest switching office for the Bell System was located on a site just below the C&O Canal, and it remains in use as a phone facility to this day. Bell originally moved to Georgetown due to the numerous legal hearings related to telephone patents, but then later created the Volta Laboratory and stayed on due to the many other scientific and technical organizations established in the region. Pulitzer Prize-winning author Herman Wouk resided in Georgetown and attended the Georgetown synagogue, Kesher Israel Congregation, between 1964 and 1983 when he was researching and writing his two novels of World War II, The Winds of War and War and Remembrance. Hollywood actress Elizabeth Taylor lived in Georgetown during her marriage to Senator John Warner in the 1970s and early 80s. Taylor's first major stage performance, in Lillian Hellman's The Little Foxes, took place nearby at the Kennedy Center during that time. Julia Child's first house is located on Olive Street. Child and her husband Paul purchased the house in 1948, although they left for France soon after. 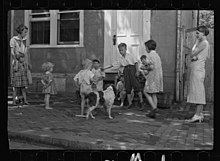 In 1956, they returned to Georgetown, living in the Olive Street house until moving to Cambridge, Massachusetts in 1959. The Exorcist (1973) was set in the neighborhood and partially filmed there. In the movie's climactic scene, the protagonist is hurled down the 75-step staircase at the end of 36th Street NW, which connects Prospect Street with M Street below. The staircase has come to be known as the "Exorcist steps". A false front was built onto the house at the top of the steps so that the bedroom windows would immediately overlook the steps. The real structure is considerably set-back. Although Burn After Reading (2008) featured Georgetown prominently, filming was done in Brooklyn. The television series The West Wing occasionally filmed scenes in and around Georgetown. ^ Fitzpatrick, Edward A.; Nevils, William Coleman (January 1936). "Miniatures of Georgetown, 1634 to 1934". The Journal of Higher Education. The Journal of Higher Education, Vol. 7, No. 1. 7 (1): 56–57. doi:10.2307/1974310. JSTOR 1974310. ^ George, Hardy (October 1972). "Georgetown University's Healy Building". The Journal of the Society of Architectural Historians. Journal of the Society of Architectural Historians, Vol. 31, No. 3. 31 (3): 208. doi:10.2307/988766. JSTOR 988766. ^ "Hours & Locations". District of Columbia Public Library. Retrieved on October 21, 2009.